Intel to avoid big screen mobile phones? In a round table discussion an Intel representative has hinted that 4-inch mobile displays are just right, with larger screens branded as ridiculous. Intel has recently entered the mobile market, with a second device running its own Medfield processor, the Orange San Diego, now available across Europe. Speaking about the Orange San Diego at the event, Intel's Vice President of the Architecture Group, Mike Bell said: "We actually think we built the right sized screen for the majority of people who don't have hands the size of King Kong. "I personally think 5-inch screens on phones are ridiculous, I know not everybody agrees with me, but I have a big hand and I still find them difficult to use." 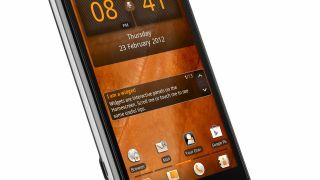 The Orange San Diego sports a 4.03-inch display, which is larger than the 3.5-inch offering on the iPhone 4S, but is dwarfed by the likes of the HTC One X and Samsung Galaxy S3, both of which have displays nearing 5-inches. Although crazy to compare the San Diego to the Android power-houses, Intel firmly believes it's produced a top-end handset. Bell said: "We think the Orange San Diego compares with the highest end of devices. "We tried to build a phone which had pretty much every feature you could possibly think of, including mobile payments, NFC, HDMI out and so on. "We did all the engineering effort to produce what would be a high end phone for anyone and Orange decided what price to sell it at. "We like that Orange is selling it for less. We're kind of proud of it, because the fact Orange is doing it means they like it enough to think it will be a big hit." Time will tell if Intel's prediction is correct, in the meantime check out our hands on Orange San Diego review for more information on the handset. Do you think Intel should stick to 4-inch mobile phones, or is there a need for plus-size screens? Let us know your thoughts in the comment box below.